In the 5 years that we've been renting our 2 vacation homes, we've had several cleaners. We'll have more to write on this subject, since having a good one significantly reduces the stress involved in running a vacation rental. But for starters, here are the questions we ask when interviewing a cleaner. These are customized for our condo on Beech Mountain, but hopefully they will give you an idea of the types of things to ask for other situations. 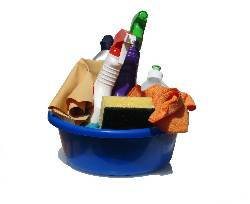 Do you supply any of the following as part of your standard cleaning (or can you supply them for an extra fee)? I would prefer to supply my own towels (bath, hand, & washcloth) and sheets, but I would like the majority of them washed and dried off-site. Advising me whenever a sheet or towel is irreversably stained or torn or missing so I can make arrangements (with your help) to replace them (and also quickly enough, so I can take it out of the renter's damage deposit). I keep double the amount of linens and towels for the maximum group my condo can accommodate, so that between back-to-back bookings you can take away the dirty ones for cleaning off-site and have enough clean ones on hand to be ready for the incoming guests. Do you have access to a washer/dryer for this? I would prefer all cleaning items be supplied by the cleaner, but I will have some of these items around the house, for guests to use, and for me to use when I’m there too. Of course, the cleaner is welcome to use them occasionally when he/she has run short on her own supplies – particularly when the next guests will arrive very soon. There are 2 King beds (1 in loft and 1 in downstairs bedroom), 2 XL Twin Beds, and one Queen sofa-bed & one fullsized “click-clack” couch in the condo. I can offer guests the option of 3 King-sized beds. Twins in one of the downstairs bedrooms can be pushed together (using a foam “bed bridge” to fill the narrow gap between mattresses) to make a 3rd King-sized bed. In order to set this up, it would require your being able to push/pull the beds together/apart (and put them back as they were originally afterwards), and move the nightstands to the side of the room. The bed frames are on wheels. During the cold months, thermostats must be kept at 55 F between guests. Make sure the dehumidifier is operating with a clean filter – most importantly during the Spring months. Do you have arrangements made for a reliable back-up if you're ill or held up last-minute? How do you select your help? How far in advance do you need me to alert you to last-minute bookings (Is 48 hours ahead of time?)? I have a 10 a.m. check-out time, and a 4 p.m. check-in time as part of the agreement that I have every guest sign (even non-paying friends and family members). So you have at least 6 hours to clean between guests when there is a back-to-back booking. At times (if there isn’t a back-to-back CKI/CKO situation, with other guests expected in on that day) I will try to be flexible with guests on the times, but this will only happen by prior arrangement, AND I will be sure to ask you first at least a day in advance. I always try to let you know whenever you have extra time too (e.g. if a guest lets me know they'll be arriving late.) Will this be OK for you? Do you have access to a digital camera or cell phone camera, so in the event a guest leaves an unusual mess or damages furniture or walls, you can provide me photographs online? If not, can you provide a written description of the damage? Do you feel comfortable with my providing information about up-coming bookings via email? Is your daily access to email reliable? If not, do you have a fairly reliable cell phone and voice mail that you check frequently (at least once per day)? Do you have a cell phone so that you can quickly contact me w/text or phone while you're at my condo, if you have questions or find something that requires me to arrange for repairs, etc.? Do you have trouble getting a signal on Beech Mtn? Do you prefer to keep a set of keys for the properties you clean, or would it be acceptable for you to access the front door key from the lockbox outside (I also have an emergency lockbox), and the cleaner closet key from the lockbox in the property)? If there is not another group due to check in on the day one group checks out, do you come on that day to at least check on things, if not to clean on that day? Will you be able check and replace light bulbs, rinse the dehumidifier filter, check the dryer vent, check TV remote batteries, & help me arrange for other light maintenance (letting in a contractor, or checking to see that job's finished, etc.)? Do you have a flat fee for running an errand (picking up some lightbulbs, a filter, some soap or toilet paper, etc.)? What is your charge for a mid-stay “freshening” of the condo for guests who are staying 14 nights or longer? What things would this entail (fresh linens, a quick vacuuming, maybe wiping down the bathrooms)?